All of us need solace and encouragement at times. Where do you take your toughest questions for compassionate, straight-to-the-point, and even surprising answers? In ancient days you'd turn to a prophet. Today there is a modern-day prophet who can answer your questions with good sense and compassion, plus help you find wisdom within yourself. Harold Klemp is the Mahanta, the modern-day prophet of Eckankar. He says that your life is your personal pathway back to God. You are like a star of God sent into this world for spiritual experience. Your questions help you grow spiritually--in love and compassion. Become more godlike. Harold Klemp's answers to the hundreds of questions you'll see in this book will uplift you and transform you. They'll help you see God's presence in your life. 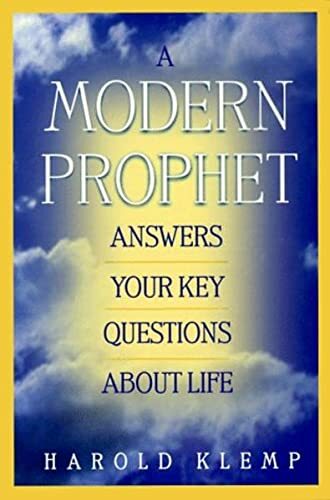 A Modern Prophet Answers Your Key Questions About Life is a guide to your own source of wisdom and deep inner joy. Author Harold Klemp is known as a pioneer of today's focuson "everyday spirituality." He was raised on a Wisconsin farm andattended divinity school. He also served in the US Air Force. In 1981, after years of training, he became the spiritualleader of Eckankar, Religion of the Light and Sound of God. His full title isSri Harold Klemp, the Mahanta, the Living ECK Master. His mission is to helppeople find their way back to God in this life. Each year, Harold Klemp speaks to thousands of seekers atEckankar seminars. Author of more than one hundred books, he continues towrite, including many articles and spiritual-study discourses. His books havebeen translated into more than 18 languages.